Let’s continue with our Quick N Dirty guide to SN1/SN2/E1/E2 – a quick walkthrough of thinking through this reaction decision. Recall that there are two important types of solvents to consider: polar protic solvents and polar aprotic solvents. Let’s do a little review, looking at polar protic solvents first. Hydrogen bonding is directly responsible for the high boiling points of solvents such as water and ethanol; the partial positive charges on hydrogen are attracted to the partial negative charges on the electronegative atoms. This is also why water is such an excellent solvent for charged species such as halide ions; hydrogen bonding solvents surround negatively charged ions like a jacket. This “jacket” of solvent molecules – much like a protective crowd of bobbies – means that these anions do not have the freedom of action they would normally have if they weren’t surrounded by clingy hordes of solvent molecules. That is, they’re less nucleophilic! The propensity to form hydrogen bonds is highest for small, highly electronegative ions such as fluorine and decreases as ions get larger (and the charge is more diffuse). This means that in polar protic solvents, the nucleophilicity of halide anions increases as we go down the periodic table. Now let’s talk about polar aprotic solvents; polar aprotic solvents are polar enough to dissolve charged species (such as halide ions) but do not donate hydrogen bonds. This means that in solvents such as DMSO, DMF, acetone, or acetonitrile, nucleophilicity correlates much better with basicity – and therefore decreases as we go down the periodic table. So what’s the bottom line when it comes to SN1/SN2/E1/E2? Let’s go back to the examples we were looking at in the first two posts. Practically, you’ll only need to consider the solvent in an SN1/SN2/E1/E2 decision when you’ve already analyzed the substrate and the nucleophile/base. This is usually the case when you have a secondary alkyl halide with a strongly basic nucleophile such as NaOCH3 or NaOH. That’s especially the case in example #2, where we really can’t make the call as to whether it’s SN2 or E2 until we’ve looked at the solvent. The fact that we are using a polar protic solvent (EtOH) is the crucial piece of information that clinches the reaction as E2. In the last post in this series we’ll look at the impact of temperature on these reactions. [Edit Dec 13]: What’s the weakness of the Quick N’ Dirty approach? Well, it doesn’t really capture the true situation in these reactions, that is, that they don’t always give one product exclusively. So keep in mind that when the Quick N’ Dirty approach says that E2 is the major product, you may also have a small amount of competing SN2 occurring as well, or if SN1 is favored, you might have small amounts of other reaction products also. The key points of this exercise is to 1) remember the major factors that affect each type of reaction, and 2) once you know the type of reaction, be able to apply it. -I think it may be important to say that in the truly ‘toss up’ cases (like #2 above), if we ran the reaction and analyzed the results by, say, GC/MS (something we do in our ugrad OChem labs… tho not for this reaction), we’d probably see BOTH E2 and SN2 products… but with protic solvents the E2 is the major organic product, and with aprotic solvents the SN2 is the major organic product. It’s not as if one solvent gives 100% of elimination, and another solvent gives 100% of substitution. -I also have my students analyze the reactions in this way. What does the nucleophile tell us? What does the electrophile tell us? What does the solvent tell us? I use these to generate ‘evidence for’ a mechanism, or ‘evidence against’ a mechanism. That’s my comment. I would hesitate to use a phrase like ‘rule out’ since psychologically that’s exclusionary thinking. I could conjure up an example where the evidence from the nucleophile ‘rules out’ an SN2 mechanism… but based on the other evidence SN2 is exactly the pathway (off the top of my head, KOtBu + MeBr). But if I tell myself a Big Bulky Base ‘rules out’ SN2, I exclude that possibility mentally. ‘Evidence against’ mentally tells me this is not my first choice… but it’s not impossible. Please post the next installment soon!! 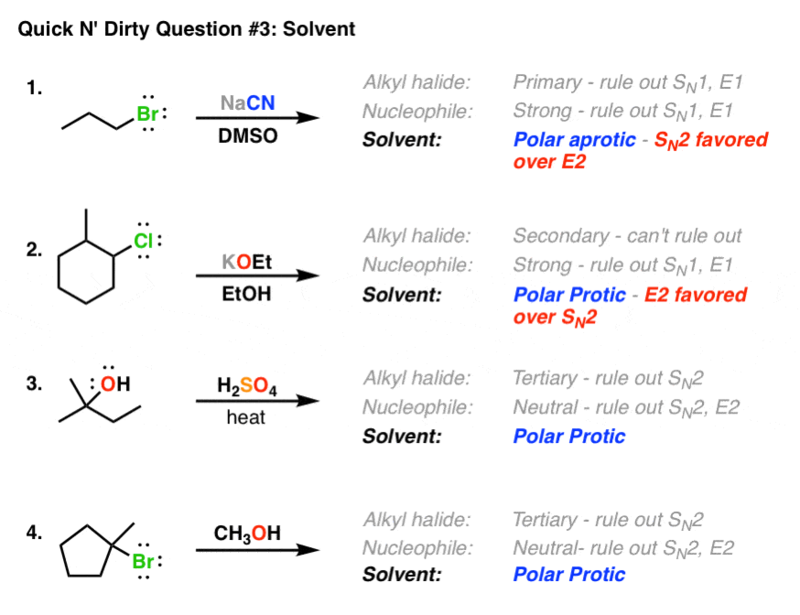 great blog, I have learned a lot, thanks for all of your hard work, if I may ask a question though, I am sure I am just missing this but WHY are polar protic solvents preferred for E2? I would think that there are a bunch of H+ floating around and for E2 we need a strong base, that this would bind to the protons before ever reaching the nucleophile? It’s not so much that polar protic solvents are preferred for E2, it’s that polar protic solvents are less favoured for SN2. Polar protic solvents lead to hydrogen bonding of the nucleophile, which you can think of as making the nucleophile more “sterically hindered”. 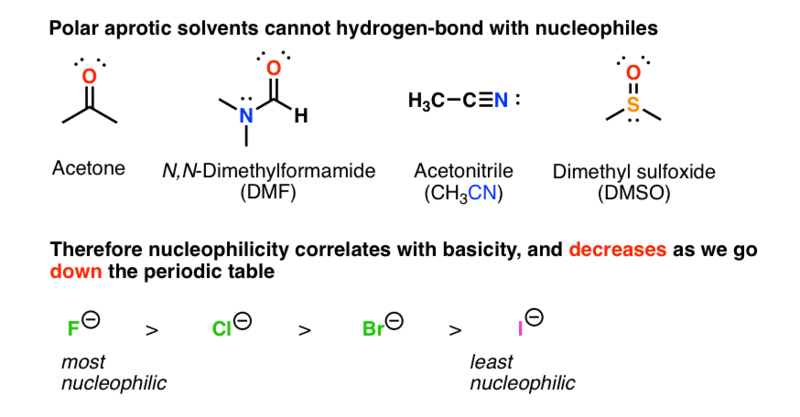 Since nucleophilic substitution is more sensitive to steric hindrance than acid-base reactions (i.e. attacking the H of the C-H bond) a polar protic solvent will tend to decrease the rate of substitution (relative to elimination) . In a situation where both reactions compete (e.g. secondary alkyl halide with a strong base like NaOH) this can be the difference between favouring substitution (SN2) vs favouring elimination (E2). My Organic Chem Prof said this is wrong. Polar protic solvents slow down second order reactions because Protic solvents weaken bases and Nucleophiles. Thank you very much for this. Honestly, I chose this over Khan Academy (mainly because I’m in quite a rush to learn this before an exam and you gave a wonderful yet concise explanation). I honestly preferred this over Khan Academy and even the 2nd language book for organic chemistry. I definitely plan on recommending this to classmates and even to my professor so that he may recommend it to future students. Cheers! Yes!!!!! I completely agree!!! Love this site and I have already told my classmates about it! Thanks so much!!! So helpful and I love how you use funny pictures and explanations, stuff sticks better that way! Orgo final tomorrow! I’ve been getting conflicting information from different sources, or maybe I’m just not interpreting it correctly. From what you say here, when the situation is set up for a bimolecular reaction, a polar aprotic solvent will favor SN2 and protic will favor E2. However I have also seen sources that list polar aprotic as a “good” solvent for E2, and this makes sense to me, because with a protic solvent wouldn’t you run the risk of protonating the base before it can abstract the beta-H? I think the same question! But I guess the effect of polar protic solvents on the nucleophiles will be much more severe than that on the bases. Is that right? This post was very helpful, but an answer from my lecturer about this confused me. The reaction was a primary haloalkane with NaOH, with water as the solvent. I thought that since water is obviously a polar protic solvent, an E2 reaction would be favoured, but my lecturer told me that the reaction is Sn2. Now I’m really confused. Any explanation? I am confused. I thought protic solvents favored sn1/e1 over sn2/e2 vs aprotic solvents favoring e2/sn2 rxns over e1/sn1. Why is that you have compared sn2/e2 here for “protic” solvents than sn1/e1? I encourage you to go back and read the two previous posts. This is the third in a series of posts on how to deduce SN1/SN2/E1/E2 by asking 4 questions. In the first post we looked at the substrate, and said that tertiary substrates were most likely to undergo sn1/e1 and primary substrates the least likely to undergo sn1/e1. In the second post, we examined the nucleophile, and said that charged nucleophiles/bases would favor sn2/e2 and uncharged nucleophiles would favour sn1/e1. Just by answering those two questions, you can determine whether the reaction will be sn1/e1 or sn2/e2 for most cases. In this third post we show how sn2/e2 can be distinguished in the case of secondary alkyl halides: polar protic solvents tend to favor e2 moreso than sn2. is it true that polar aprotic solvents are not used in SN1 reactions because some of them can react with the carbocation intermediate and give an unwanted product. Rather, polar protic solvents are preferred ? how eh ? Polar aprotic solvents cannot react with the carbocation intermediate. Rather, polar protic solvents are used because they are generally more polar than polar aprotic solvents. Thank you soo much ! This website has been soo helpful!! Anytime you see the cyanide anion you’re likely looking at a nucleophilic substitution.